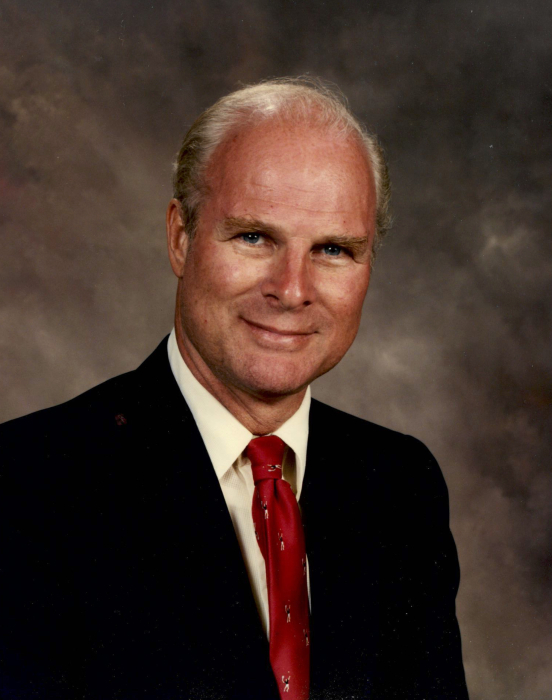 Obituary for Jack Harrison Vining, Sr.
Jack Harrison Vining, Sr. of Columbia, CT passed away February 2, 2019 surrounded by his family. His passing was due to complications of a stroke. He was born in New Haven, February 29, 1932 (a leap year baby) the only child to Jackson L. Vining and Catherine Elizabeth Harrison, of Ft. Valley, GA. In 1947, the family moved to Willimantic, CT where in 1948 he was Co-Captain, an outstanding running back and defensive player on the Windham High School football team. Jack was also the captain of the school's Rifle Team and an excellent marksman. Upon graduating in 1949, he attended a postgraduate year at Deerfield Academy in Deerfield, MA where his love for skiing began – joining the Hartford Ski Club, becoming a member of the National Ski Patrol, and skiing in VT at his classmate’s father’s new ski area, Mad River Glen. Jack was accepted to Amherst (MA.) College, Class of 1954, where he became a member of Delta Kappa Epsilon, and played football and lacrosse. College also included a degree from Hillyer College (now University of Hartford) and the Navel Reserve in the OCS program. After college, he went into the Navy full time and while stationed in Puerto Rico, he met and became engaged to Madge Burt Alexander of Monticello, FL and Atlanta, GA, a teacher in the Puerto Rico US Government schools. They married July 12, 1958, in Monticello, FL, and have celebrated 60 years of married life, living in West Hartford, Bristol, and settling in Columbia, CT in 1964 to raise their family. After his service in the military, in 1958 he started his 18-year management career with Friendly Ice Cream Corporation, including the Willimantic Friendly’s on Main Street before a promotion to District Manager. In 1977, he left Friendly’s and with a partner bought the Broad Street Dairy Queen in Manchester, CT. During this time, he returned to the service of his country and became a part time member of the CT Army National Guard, and after selling the Dairy Queen restaurant in 1987 he entered the National Guard full time. He retired from the military February 29, 1992, devoting 21 years to the US military and the service of his country. Throughout his adult life he Ski Patrolled, first at Stowe, Mad River Glen, and from 1967-1978 as Patrol Leader of UConn’s on-campus Husky Hill Ski Area during the area’s operation. He later patrolled with the Manchester (Mt. Nebo), CT Ski Patrol and after retirement, joined the Mt. Southington Ski Patrol. His joy was Friday mornings and afternoons when each year, he paired with a disabled child from the CT Children’s Medical Center and Newington Children’s Hospital, teaching them how to ski and with other children, using ropes and special equipment to guide them down the slopes in special ski chairs for the wheelchair bound. At Southington, he received the first annual Ski Patrol Director’s Award thereby setting the standards by which future recipients would be judged. Including Jack’s time as a National Ski Patrol Alumni he had a total of 70 years of ‘Service and Safety’ to the NSP. Jack and Madge both retired in 1992 and have spent their retirement years traveling to their homes in Siesta Key, FL and Freeport, Bahamas as well as enjoying their 8 grandchildren at their home on Columbia Lake. Jack will be missed by many! He is survived by his wife of 60 years Madge, his children Mark Vining, Debbie Vining Forde and her husband Jim, Jay Vining and his wife Sue, and Lynsie Vining White and her husband David. He is also survived by 8 grandchildren, James Forde, Jackie Forde, Jessica Vining, Scott Vining, Nicole Vining, Kyle Vining, Victoria White, and Isabella White. Calling hours are Friday, February 8, 2019 from 4:00 pm – 7:00 pm at Potter Funeral Home, 456 Jackson Street, Willimantic. The funeral is Saturday, February 9, 2019 at 11:00 am at Columbia Congregational Church, 325 Route 87, Columbia and burial with full military honors will take place immediately afterwards in the West Street Cemetery, 102 Lake Road, Columbia. In lieu of flowers, please consider a donation to the Columbia Congregational Church or a Veterans charity. For an online memorial guestbook please visit www.potterfuneralhome.com.